← This is a really nice restaurant…in Berlin! MOST welcoming Black Bird Cafe…near the Cathay cinema. I was at the launch of Equal’s new product which now uses Sucralose, instead of Aspartame which cannot withstand high heat. Sucralose, on the other hand CAN withstand high heat and therefore can be used in baking and other applications where the ingredients are subjected to high heat. 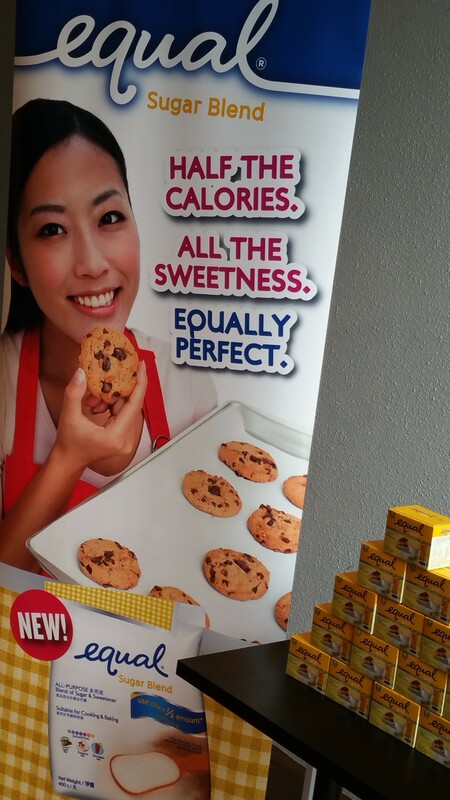 It is also a non-caloric sweetener, so you will not get fat! No Calories at all. Sugar, especially refined sugar and carbohydrates make you fat! I kid you not! Scientific studies prove it. The very bad news is that obesity leads to terrible chronic diseases like the dreaded Diabetes. I was very keen to see and learn about the new products, namely, Equal Gold and Equal Sugar Blend. There was food tasting too, with dishes made using the new products. As the Travelling Gourmet TM, I have a lot of food and wine tasting. That is why I also use Equal in my diet and exercise daily! 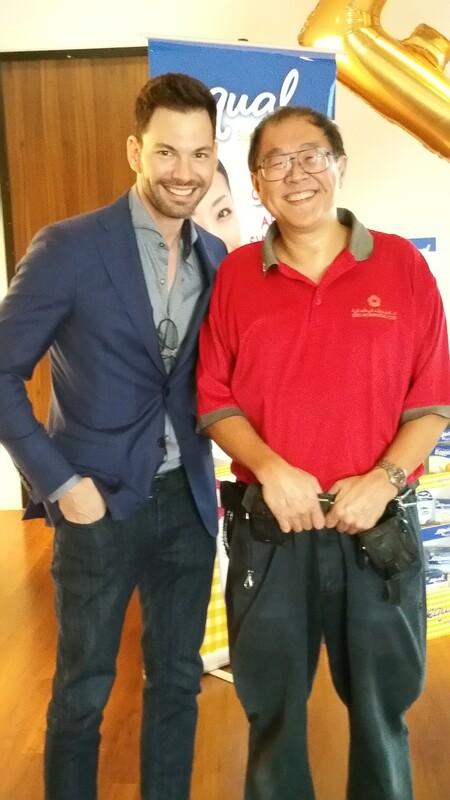 The compere for the event was the American actor known for his potrayal of a crusading journalist in the Mediacorp TV Crime Drama series called “Keong Saik Road”. Bobby Tonelli is from the USA and is of Italian ethnic extraction. I enjoyed his laid back presentation introducing Equal’s new products to the audience. A nutritionist, Ms. Hyumi Wong was on hand to explain how your body does not recognise Sucralose as a sugar and therefore it will not be metabolises but excreted. This means there will be no spike in your blood sugar level. This is very important for diabetics. Sucralose is safe and approved by the US FDA (Food & Drug Administration) and the European Food Safety Authority and many more government agencies. Do not pay attention to the false and misleading information on the internet about the dangers of artificial sweeteners and microwaves and fluoride in your drinking water! Sucralose has been consumed by millions in over 80 countries worldwide. Sucralose has been found to be safe for use as a food ingredient by the general population, including children and women who are pregnant or breast-feeding. It is also suitable for people with diabetes, because it does not affect blood glucose or insulin levels. Researchers at Queen Elizabeth College, University of London, discovered sucralose in 1976, during a collaborative research program with UK sugar producer, Tate & Lyle, PLC. Sucralose is made by a multi-step process that starts with ordinary table sugar (sucrose) and replaces three hydrogen-oxygen groups on the sugar molecule with three chlorine atoms. This results in a stable sweetener that tastes like sugar, but is calorie-free. After being discovered, sucralose was put through a conclusive safety testing program over a 20-year period. Today sucralose is permitted for use worldwide. To start…Savouries included Salmon Bruschetta, Creamy mini Chicken Vol au Vent. Mushroom Tartelet with truffle Oil and Pulled Pork Risotto Arancini Ball. Quite yummie! Sweets by Chef Sinclair Wong were tasty Tiramisu with Equal Gold which had only 522.8 Calories compared to 834 Calories from normal sugar or sucrose. Earl Grey Tea Creme Brulee with Equal Gold was nice but there was no crispy caramelized sugar on top. Only 516 Calories compared to 697 with sugar. This is how to eat your cake and still have it! There was also Panna Cotta with Equal Sugar Blend which has half and half of Equal and Sugar. Pretty good too. At the end of the day, be healthy and make good nutrition choices. Food makes the man. eat healthy and be healthy! ENJOY! My next clever and cunning plan is to make one of my famous Fruit Cakes with Equal Gold…ENJOY! This entry was posted in Chocolates & Desserts, Fabulous Food, Fabulous Food and Gorgeous Drinks, Food and drink, Let them eat Cake..., News and politics and tagged Bistecca al Fiorentina, Black Bird Cafe, Bobby Tonelli, Chianti Classico form Tuscany, Creme Brulee, Dr. Michael Lim is The Travelling Gourmet TM, Equal artificial low calorie sweetener, Equal Gold with Sucralose, Equal Sugar Blend, lava Cake, Moelleux aux Chocolat, Pamnna Cotta, Sucralose a non calorific sweetener, Tiramisu. Bookmark the permalink.